Toronto Stormwater Tax - Underhanded Double-dipping or Transparent Equitable Service-Based Fee? While a Toronto Councillor has lifted his middle fingers to a stormwater 'tax' in the City of Toronto, suggesting such as charge is underhanded and a way of charging for a service residents already have, he's wrong. A proposed stormwater utility fee based on hard surfaces is a more equitable way of allocating costs for drainage services in Toronto - currently residents and businesses pay for stormwater management capital works through their water bill - yes, depending on how much water you use. Water consumption has nothing to do with runoff, whereas hard surfaces do. That is why many Canadian municipalities have implemented stormwater rates to fund operating programs and capital works related to stormwater. Local municipalities near Toronto with stormwater rates in place include Richmond Hill (flat rates), Markham (flat fees for residential and variable fees for businesses of various sizes), Mississauga (based on flat fee tiers for residential and variable based on hard surfaces for other properties), Kitchener and Waterloo (similar approach as Mississauga), Aurora (flat rates), St. Thomas, and London. And stormwater fees are in the works for Guelph and Vaughan. Do these fees fund existing services? Sometimes they do and municipalities transfer program funding from existing funding sources (water bill or tax bill) to the new dedicated stormwater fee. In that way it is hardly underhanded, but rather transparent and equitable, where the fee is in proportion to the service being provided. Toronto's project backlog for basement flood protection has grown considerably as Municipal Class Environment Assessment studies are completed across the city, identifying infrastructure upgrades that come at a considerable cost. As examined in other posts, design standard upgrades are required to address level of service limitations in many areas across the City of Toronto. This is especially needed in areas with partially separated sanitary sewer systems with high extraneous wet weather flow rates that overwhelm drainage systems during extreme weather events. Extreme rainfall is not more severe in Toronto, so there are not new rainfall stresses on infrastructure - there are stresses due to intensification and urban growth over decades as noted in previous posts. Nonetheless, there is a considerable legacy of designs with limited levels of service that should be addressed with sustainable, equitable service-based funding. A Toronto stormwater charge based on hard surfaces, sometimes called impervious surfaces, will be an improvement over current funding through the water bill. Expanded post with regional trend data. CBC News published a story describing record rainfall due to the remnants of Hurricane Matthew. While the 225 mm of rainfall recorded over the short Sydney rain gauge monitoring period is a record, the record in the region in Halifax, Nova Scotia was 239.5 mm back in September 1942. Environment Canada's Engineering Climate Datasets provide historical records - an excerpt of Halifax data is shown below. It is likely that if the 1942 event was not recorded then longer duration events would have increasing trends too in Halifax. This helps illustrate the random nature of recording records. Records should be reviewed with caution unless the observation period is very, very long. Sydney records only began in 1961 missing the 1942 event, suggesting the 2016 event is a record for that area ... well it is, but only because the observation period is relatively short to assess extreme events ..... if a tree falls in the forest and noone is there to hear it we think it really didn't occur. In a recent report by CTV News Atlantic about flood damages in Sydney, Nova Scotia, an incorrect statement on extreme rainfall trends is made. "(Mayor of the Cape Breton Regional Municipality Cecil) Clarke said the weather is a reminder that climate change is contributing to more intense storms on the East Coast." "The decreasing regional trends for the 5- to 15-minute durations are mainly located in southern Quebec, most of the Atlantic provinces, and in southern Manitoba and Alberta." Environment Canada reports the "maximum non-significant decreasing trend value in the AMS (Annual Maximum Series) amounts of −4.4% per decade (-0.44% per year) for the 5-minute duration." Drilling down into the local area, Sydney has no statistically significant trends in annual maximum rainfall intensity, based on Sydney CS Station Number 8205702 data trends. "Also,the most likely sample average value for any small sample from a skewed population will be below the mean of the skewed population being sampled. Experienced actuaries are aware of these issues. However, we have to be on guard and not fall back on easy assumptions that are appropriate for results from symmetrical distributions." Environment Canada Engineering Climate Datasets show that it took twenty years for a 100 year statistic to be exceeded in Sydney - observations started in 1961, and 100 year 30-minute to 24-hour intensities were observed in 1981. That raised the bar on the baseline conditions, making it harder to exceed the 100 year statistic. Then in 2012 the 100 year statistics were exceeded for only 1 and 2 hour durations, meaning it is becomes harder to exceed over time as a longer record better reflects the underlying characteristics and extreme value probabilities. The 2016 Hurricane Matthew statistics should exceed the 100 year statistics again - raising the statistics to better reflect the underlying distribution of extremes. But with only 53 years of record since 1961 (1992 and 2010 are incomplete), the chances that a 200 year or 500 year extreme storm has been observed are rare. This is a reminder that regional storms can be considered in floodplain management and urban drainage design. If Sydney drainage systems (floodplains, infrastructure) were designed considering the 1942 Halifax storm as extreme regional conditions, perhaps flood damages would not be so severe. Hurricane Harvey a category 4 storm is expected every 9 years or so. 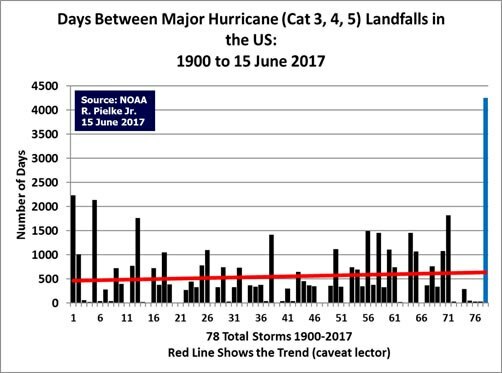 So it is due given the gap in days since a hurricane. Reporting on the Windsor and Tecumseh flooding in September 2016 and August 2017 highlights the gaps in extreme weather reporting in Canada .. and amnesia regarding past events... and the unwillingness to explore other factors affecting flooding, like hydrologic changes. The Fishy: CBCNews reports "I've never seen anything that intense in the 35 years I've been in this region," (Tecumseh Mayor Gary ) McNamara said. "This is unprecedented." The Fishy: "That beat the record for that date in history, which was formerly 36.8 mm set back in 1973." ... this is a fishy statement because drainage systems are not designed to specific calendar day rainfall characteristics. In fact annual series of maximum daily, hourly, and 5 minute intensities are used to characterize weather. This is a typical headline-grabbing technique such as when the July 8, 2013 storm in Mississauga was reported to be triple the maximum record ... ummm... for a calendar day that usually does not receive hardly any rain. This inaccurate reporting sets up the 'anchoring bias' in the readers' perception of the rarity of the event. The Facts: CBCNews reports the August 28, 2017 rainfall was a record "Windsor airport recorded a rainfall of 57.4 millimetres, shattering the old record of 43.2 mm of rain for Aug. 28 recorded in 1961." The Fishy: Reporting records based on 'calendar day' is wrong. No rainfall statistics are derived based on calendar day for the purpose of analyzing extremes or designing infrastructure. Can you imagine if we designed bridges for the number of heavy trucks that cross them on August 28ths? That would be silly - it is easy to find the historical August 28 rainfall numbers, but it is meaningless to measure the severity of storms relative to that isolated calendar day record. The Weather Network's Chris St. Clair says on the October 1, 2016 morning broadcast that the Windsor storm was "unprecedented" ... its not clear if he meant unprecedented for September 29th's, which is irrelevant, or unprecedented for the region on any calendar day which is plain wrong. In a later report he calls the rain event 'unbelievable'. The Weather Network started broadcasting in September 1988, so perhaps it should be aware of the Harrow Storm in 1989. The Weather Network's Kim MacDonald reports that Tecumseh received twice its average monthy rainfall in 15 hours on the October 1, 2016 broadcast - this reporting is another example of an 'anchoring bias' - comparing a rainfall statistic to another statistic that is irrelevant to drainage design - no drainage systems are designed for monthly totals, instead they are designed based on annual extreme time series and derived extreme value statistics to project rare conditions that may have not even occurred yet. See our post on heuristic biases in rainfall reporting. Kim MacDonald notes that 1700 flooded homes were reported in this 2016 storm. In the 1989 Harrow Storm CBCNews reported 2000 flooded homes. Unprecedented? Big picture questions for Essex Region could include whether the 100 year regional storm design standard is big enough for the region. 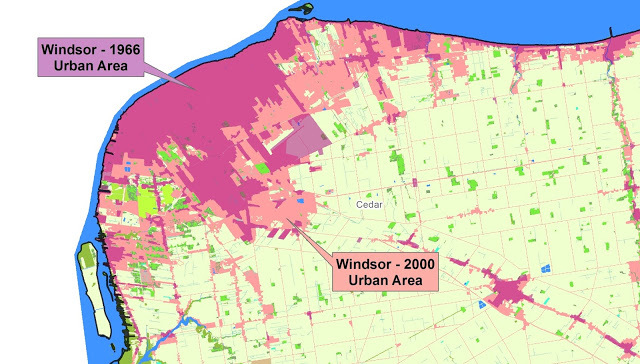 Other conservation authorities regulate to larger storms - Upper Thames uses the 250 year storm - most others use Hurricane Hazel, which is perhaps a 500 year storm. Other regions use large historical storms like the Timmins Storm. Perhaps it is time for the "Windsor Storm" based on the September 2016 storm. Another question - are local flood hazard limits keeping up with hydrologic changes to the region over decades? We explore this for many Ontario cities here - but here is a map of the growth from the 1960's to late 1990's. Pink areas are expanded urban area. Consider this: when your design standard is so low (Essex Region has the minimum 100-year flood standard in Ontario according to the Provincial Policy Statement on natural hazards), the importance of expanded development and intensification in existing development areas is an even more important factor when considering increased runoff and flood risk. Why? Because pervious land uses can absorb some fraction of 'small' 100 year storm but not much of the large storms used in other regions. Those using Hurricane Hazel design storms which saturate the ground with anecedent moisture conditions (US Soil Conservation Service AMC III conditions to be exact) do not have as significant an increase in runoff following development. Those using 100 year storm, like Essex Region, use the drier AMC II conditions in hydrologic models, meaning that the soil-vegetation surface can absorb relatively more ... until it is paved over. Environment Canada corrects CBC story that storms are getting worse in the Windsor Region over decades. 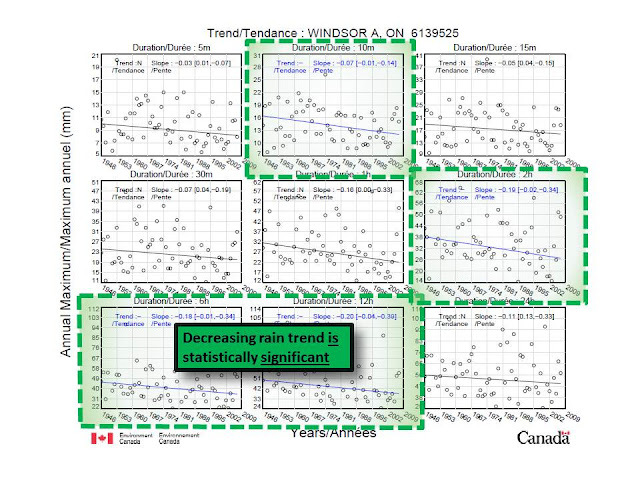 Up until now Windsor Airport had decreasing extreme rainfall trends like most of southern Ontario, according to Engineering Climate Datasets. As summary is below. Here are more details. It will be interesting to see if companies offering sewer back-up insurance or overland flood insurance will pay for all claims related to this storm. Runoff rates obviously exceeded the drainage system capacity in many areas, meaning flood damages were due to surface water entering properties, which is excluded from most homeowner policies. Surface water flood damage endorsements are available from Aviva, Intact and RSA. Following recent extreme events, these companies have tried to clarify coverage exclusions to homeowners, encouraging them to sign up for overland, surface water flood coverage. It is unclear how state of emergency / disaster relief funding would offset insured and uninsured damage claims.